When I woke up yesterday morning as usual just before five a.m., it was raining lightly so it was still somewhat dark outside. 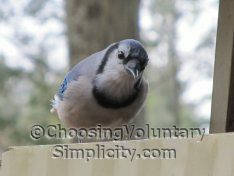 As I looked out the window towards the woods and the brook, I noticed that the bird feeder down there seemed to be tilting in an odd direction… and that there was a tall, dark shape in front of the feeder. 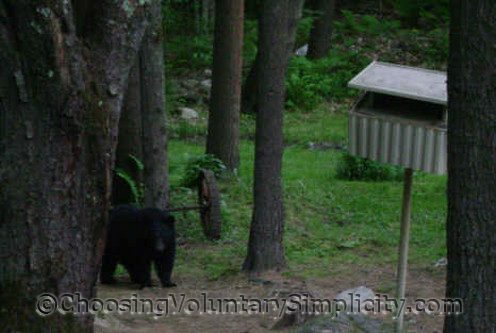 When the dark shape suddenly changed position, I realized I was looking at a black bear, standing upright with his back towards me and his head pushed deep inside the feeder. There are a lot of bears around here this year, and the local wildlife people have been warning everyone not to feed them. They especially warn to take the food out of the bird feeders, so ours have been empty for weeks. I think this bear was probably quite young because he was much smaller than the bears we usually see… although he was still plenty big enough. 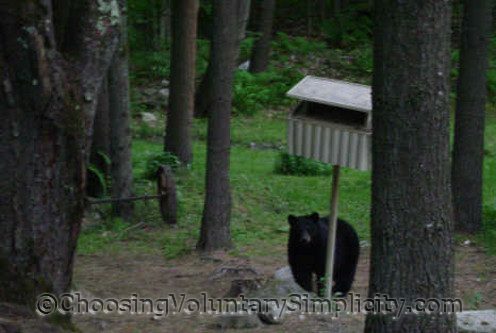 Standing upright, the bear was slightly taller than the bird feeder tray, which is six feet off the ground. 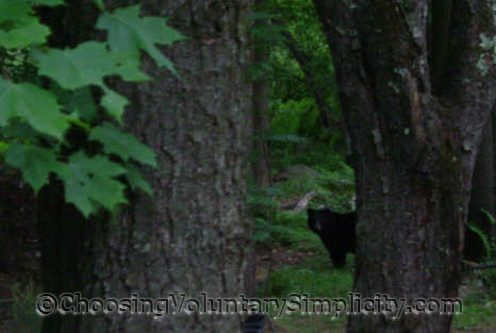 At first we watched the bear through the window… then we quietly opened the back door and stepped out onto the porch and then out onto the lawn. That’s when we realized that the bear was watching us with as much interest as we were watching him. I have never had the opportunity to watch a bear for such a long period of time before… usually we see them and they’re gone before we can even grab the camera… but this bear stayed calm and unconcerned no matter what we did. The bear was playful and inquisitive. He kept going back to look inside the empty feeder and to lick the soil under it. He sat down and cleaned his paws and he rolled around on his back in some tall, wet grass. He walked around, scratched in the dirt, and “investigated.” Finally he walked to the brook, drank for a long time, and ambled back into the woods. And we went back inside the house… and out of the rain! I found your blog while following links online the other day and I am thoroughly enjoying it. Your writing is wonderfully readable and your topics are dear to my heart as well, perhaps because I live in rural New England too. Great pictures of the black bear! I know they make their way around here occasionally, but I haven’t seen one at the feeders yet. I am hoping my dog is leaving enough scent around the yard to keep them away. Wow! That must have been a surprise to see! 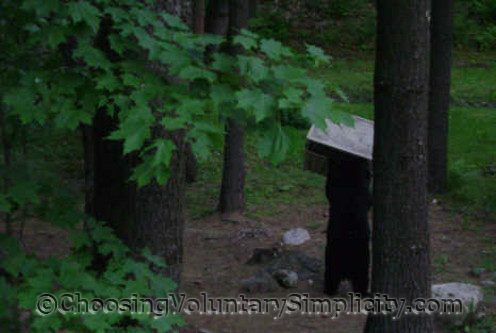 Once I looked outside and saw a skunk in my backyard but I have never seen a bear even at a distance. You were braver than I would be to go outside and look at it from there. I really enjoy this blog, the writing and the stories really make me feel at home. Thank-you! If I got that close to a live bear I would be shaking too much to hold the camera. You got some great photos though. It must be fun to live near wildlife like you do. My life is city oriented. It is all I have known but I can dream. Great pictures and a wonderful story. Your blog is awesome. That bear must be a cub from last year and he must be very lonely and hungry! Hungry as a bear is not a joke. They eat and eat and eat until its time to hibernate. Sort of like some people I know called teenagers. The birds must be quite tiffed-off at the bears keeping them from their seed. And I would be, too. One of the joys in life is watching the birds at the feeders outside my window. Pound for pound, I’ll bet the birds eat more than a bear any day. At least they do around here! My cat, who never goes outside, “talks” to them through the window. She would probably hide under the bed if she saw a bear. Me too. My daughter and her family have 21 acres just east of Springfield, MO. They have spotted black bear in their area along with bobcats and unfortunately mountain lions. Actually, they lost their black lab to a mountain lion just two yrs. ago. The vet tried to save him, but he was just too weak to survive his injuries. Please be careful when you live out in the country. Our daughter has 3 small children and now has a gun with her (has a conceal and carry license) when she is out on her land. At first my husband and I were not happy she had a gun, but after losing two dogs over 90 lbs. to wild animals, we think it was the right choice for her and the kids safety. Her and her husband live on beautiful acreage and they love it. I know that I am definitely a suburb kinda girl, but not her.